As in recent posts, I’m trying to get as much out of the herbs from my garden before it’s too late. Last night I chose to make something with my rosemary. 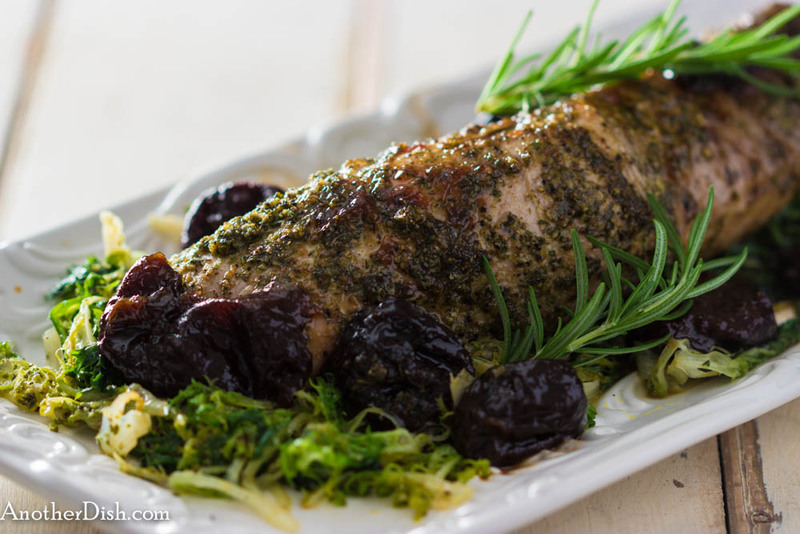 I made this wonderful roasted pork tenderloin — the pork is prepared by rubbing it with a garlicy rosemary and olive oil paste. The aroma is fantastic! The pork is served over a bed of frisée that’s been slightly wilted in some of the rosemary paste, then topped with a sweet/sour plum sauce (I served it with mashed potatoes). This turned out to be delicious, so I hope you’ll try it out! Place olive oil, garlic, rosemary, salt and pepper into a food processor. Process to a smooth paste. In a shallow roasting pan, coat pork well with 3 1/2 Tbsp of the rosemary paste (set remaining paste aside). Place pork in oven and roast until middle of thickest part registers 150 degrees F, about 30 minutes. Remove pork to a cutting board and loosely tent with aluminum foil. Heat remaining rosemary paste in a large sauce pan over medium-high heat. As soon as paste begins to sizzle, stir in the chicken stock, then the frisée. Cover and cook until wilted, about 6 minutes. Divide frisée among 6 plates. Top each with pork slices and plum sauce. Serve. This entry was posted in Main Dishes, Pork and tagged Cooking, Food, Food Photography, Foodie, Recipes on September 8, 2014 by AnotherDish.